A Review of Real Men Keep their Word. What is Kabul, Afghanistan like? Read the English translation of Akram Osman’s collection of Dari short stories and you will discover the heartbeat of traditional Kabul culture, prior to the recent political and social upheavals. You will find ordinary Afghans who struggle with real life issues such as personal identity and unrequited love. You will learn about Afghan heroism and laugh at the pretension of those who clamor for name and fame. Sher had kept his vow. But, alas, in keeping his word, he lost the love of his life. He sacrificed that which was most dear to him in order to keep his word. To this day, the story of Sher and his lost love resonates with what is considered to be authentic Afghan heroism. During the last thirty years, Afghanistan has been thrown into such a deep military and political quagmire that much of its cultural heritage lies buried beneath the rubble of a devastated nation. Yet, behind this dismal scenario, many Afghans carry fond memories of traditional Kabul culture, some of which has been preserved in the short stories written by Dr. Akram Usman in the 1970’s and 80’s. His stories bring to life the popular folk culture of urban Kabul during the mid-twentieth century. While some of the stories drip with nostalgic heroism, the reader easily identifies with characters who struggle with personal identity in light of a changing society or who experience the pain of unrequited love. The reader will laugh at the farcical pretension of those who try to ‘climb the social ladder’. Many a Kabuli can fully see himself or herself in one of Uthman’s stories. The stories will be of interest for the academic interested in 20th century Afghan studies as well as the general reader keen to learn more about a brighter side of modern Afghanistan. What was Kabul, Afghanistan like before all the turmoil? Read the English translation of Akram Osman’s collection of Dari short stories and you will discover the heartbeat of traditional Kabul culture, prior to the recent political and social upheavals. Akram Osman was born in Herat, Afghanistan in 1937. He obtained a law degree at the University of Kabul (1962) and studied law and political science at the University of Tehran, completing a doctoral degree in 1971. He began writing short stories in the 1960’s, many which were aired on Afghan radio and television and published in magazines. Already in 1964 he was awarded the Rahman-Baba Prize in literature. He has always been deeply involved in the cultural life of Afghanistan, serving as the Minister of Information and Culture for five years (1973-1978). He published his collection of 22 short stories under the title Mardara Qawl as, in 1988, reprinted 1998 and again in 2003. Operation Mercy Afghanistan printed it yet again in 2006 and added more of his stories. Afghan Film has made cinema productions from two of his stories. Akram Osman has resided in Sweden since the mid-1990’s from where he has published a further short stories. Arley Loewen grew up on a small farm in south-eastern Manitoba, Canada, but has studied, lived and worked in the South – Central Asian context since 1981. He is a specialist in Persian culture, earning his PhD in Toronto, Canada. He holds a master degree in Persian Literature from Islamabad, Pakistan. He is project manager of Safari Consultants, a project for culture, publishing and leadership development in Afghanistan. 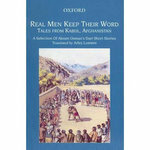 Oxford University Press published his translation of a collection of Dari short stories, Real Men Keep their Word (2005), now in its second print. He runs leadership and management training seminars throughout Afghanistan and has published his lectures in book format, New Horizons for Afghanistan (2007). It is available in English, Dari and Pashto. He also teaches on South Asian / Middle Eastern cultural and religious themes for western audiences. He lived in Kabul with his wife, Janice, and two teen-aged daughters for four years (2003-07) and continues to travel to Afghanistan regularly to run leadership seminars. Contact Arley if you would like to request his speaking schedule or to obtain his books. Do you have an opinion on a book about Afghanistan you just read? Your story will appear on a Web page exactly the way you enter it here. You can wrap a word in brackets to make it appear bold. For example My Review would show as My Review on the Web page containing your review.